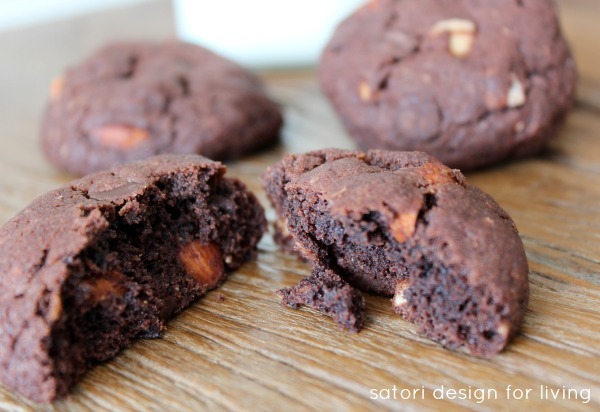 Make these sinfully rich and decadent double chocolate almond cookies. Totally worth the splurge for a self-proclaimed chocoholic! Around here, we’ve really cut back on eating sweets. But, when I made these double chocolate almond cookies for my son and his college friends, I knew I was in trouble! Of course, I had to sample at least one to make sure they were tasty. That’s a mom’s duty, right? Believe me when I say these cookies are love (hate?) at first bite. Before I share the recipe, I must warn you. The smell coming from your oven will have you hooked (kind of like when you walk past Cookies by George at the mall). Take one bite and it’s all over from there. Kind of like my sweet potato brownie bites! In a large bowl, beat together butter and both sugars until smooth. Add the egg and vanilla, and mix well. In a separate bowl, combine flour, cocoa, baking soda and salt. Gradually beat into butter mixture. Stir in almonds and chocolate chips until well combined. Roll into balls (I used a small ice cream scoop to ration them out) and place at least a couple inches apart on the baking sheet. Bake for 10-12 minutes (depending on size). They will be a bit firm on the top, but soft in the center (don’t over bake, as you want them ooey gooey on the inside). Remove from oven and let sit for a couple minutes before you transfer them to the cooling rack. 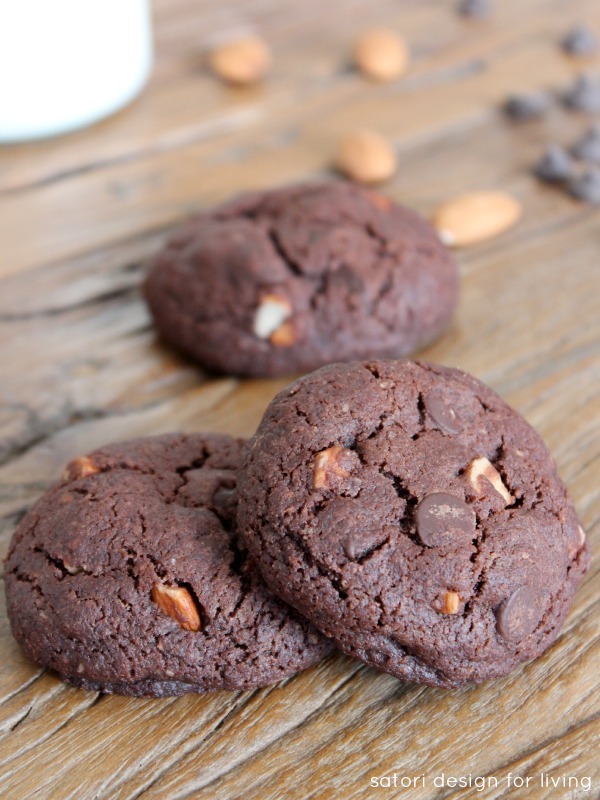 Sinfully rich and decadent double chocolate almond cookies that are totally worth the splurge! Bake for 10-12 minutes (depending on size). They will be a bit firm on the top, but soft in the center (don't over bake, as you want them ooey gooey on the inside). Remove from oven and let sit for a couple minutes before you transfer them to the cooling rack. Pin these double chocolate almond cookies for later! Are you looking for more delicious cookie recipes? These look incredible! Did you say you had a son in college?? I had to reread that several times. I do not believe you, girl! Believe me, I have a hard time wrapping my mind around it too. Watch it, they’re grown before you know it! Oh boy. Chocolate, almonds – I had to pin, but I’m afraid to make! I know they won’t last long around me!!! Oh yum! Now I want cookies! Off to pin! Thanks for sharing! These look soooo good! I love almonds! Also, how do you have a son in college? You are so young looking! Beautiful! These look delicious – nice and thick! I’ll have to try them. Oh yeah, you had me at the first photo – yummmmm! I LOVE chocolate and almond together, these look fabulous! I don’t do a lot of baking, but I just might make THESE. That picture is way too enticing!